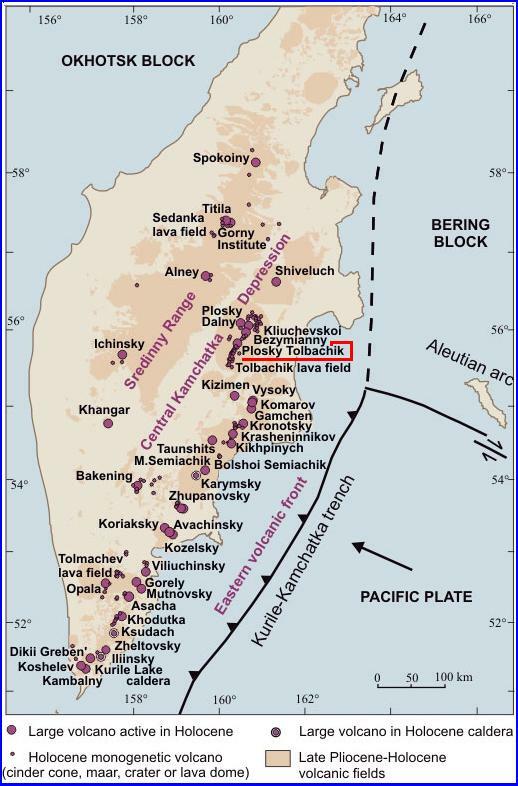 Hidden Surprises at Kamchatka Peninsula? 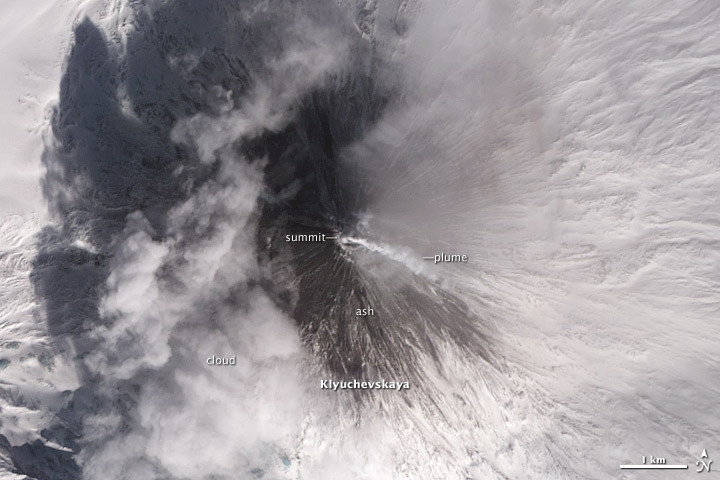 Klyuchevskaya Volcano on Russia’s Kamchatka Peninsula underwent explosive ash and lava eruptions earlier this month, including one on two days ago which ejected a plume of smoke and ash to a height of 6,000 meters. 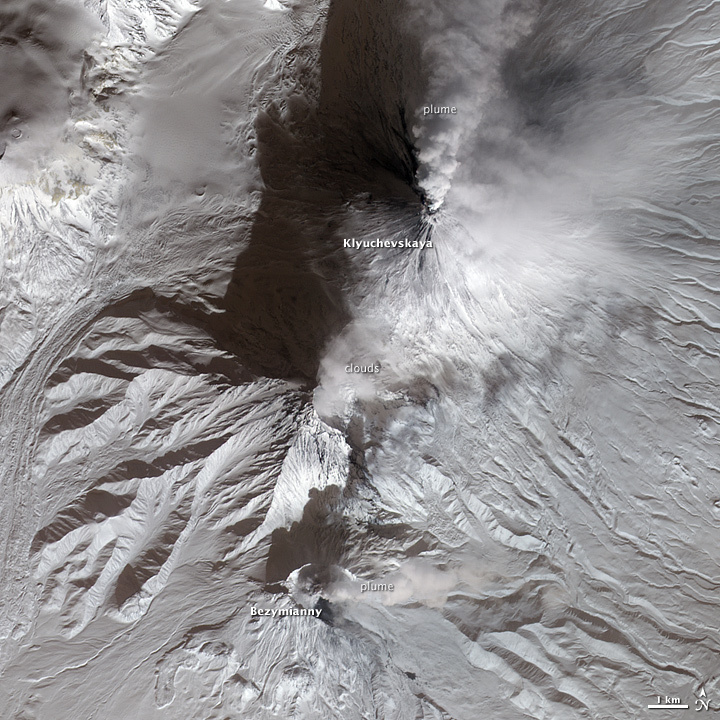 Image acquired March 10, 2010. Credit NASA (Instrument: Terra – ASTER). Click images to enlarge. Lava and Snow on Klyuchevskaya Volcano. 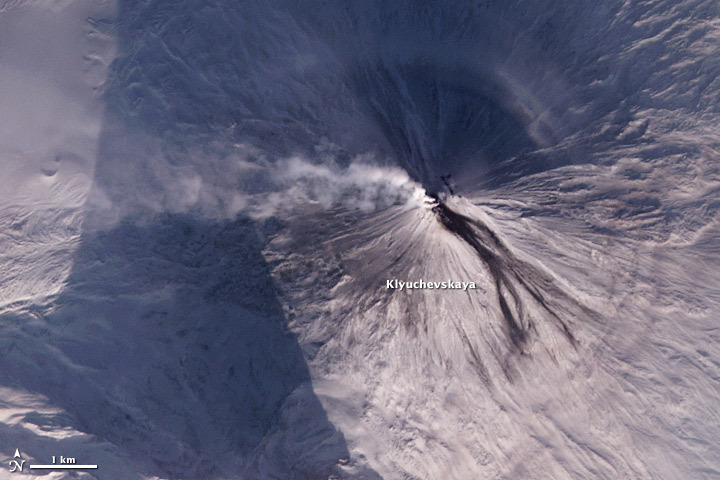 “According to the Kamchatka Volcanic Eruption Response Team, Klyuchevskaya Volcano has been displaying a range of volcanic activity over the past week, including gas-steam plumes reaching six kilometers (20,000 feet) above sea level, flowing lava, and Strombolian eruptions reaching 300 meters (1,000 feet) above the summit, ” NASA reported. (date: Feb 13, 2010) Credit NASA. Lava on Klyuchevskaya Volcano. 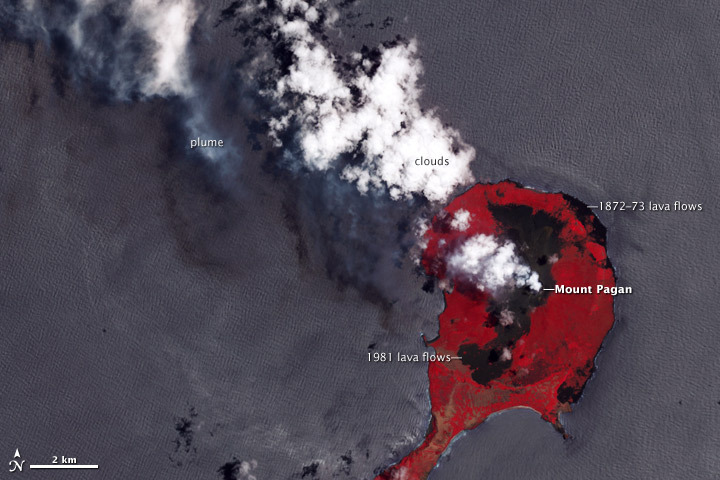 The dark streams in this satellite image are lava cascading down the southeast flank of Klyuchevskaya volcano. A thin plume of smoke and steam extends due west from the summit. Klyuchevskaya was active throughout most of 2009. (date: Dec 11, 2009) Credit NASA. Sakurajima Volcano in southern Japan erupted more than 400 times during 2009, and activity was increasing in early 2010. 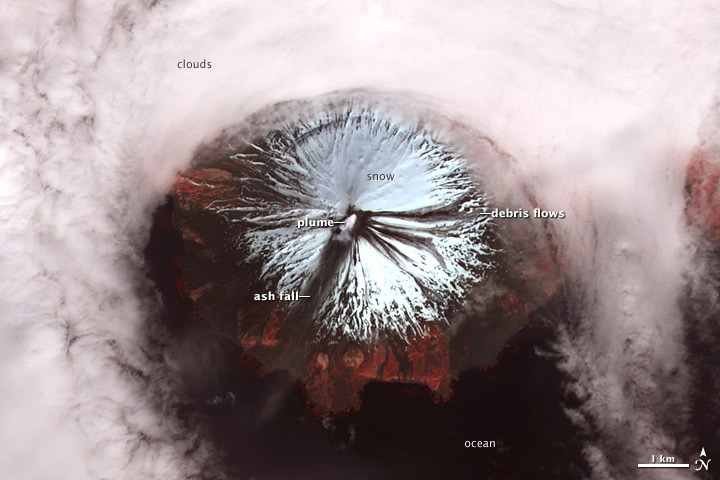 The Advanced Land Imager (ALI) aboard NASA’s Earth Observing-1 (EO-1) satellite captured this natural-color image of the erupting volcano on February 15, 2010. 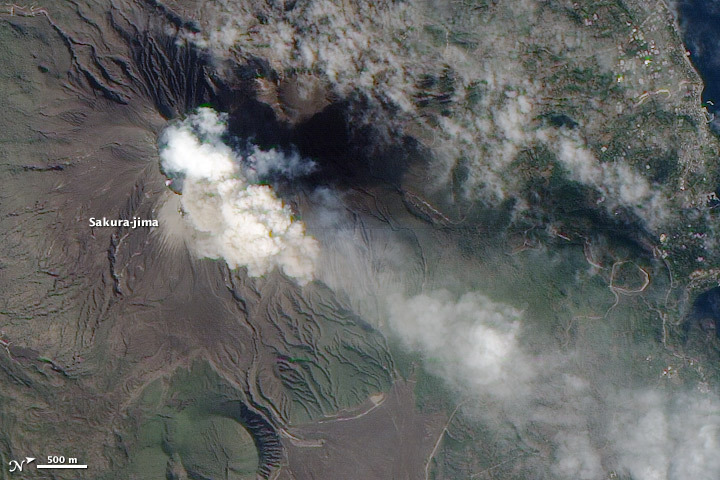 Gray ash is visible in the plume that extends northeast (towards the lower-right) of the volcano. Ashfall is a regular occurrence at the daikon and mandarin farms surrounding the volcano, as well as in the nearby cities of Kagoshima and Kirishima. NASA Earth Observatory image and caption by Robert Simmon. Click image to enlarge. Neighboring volcanoes on Russia’s Kamchatka Peninsula Klyuchevskaya Volcano in the north and Bezymianny Volcano in the south both erupted. The Advanced Spaceborne Thermal Emission and Reflection Radiometer (ASTER) on NASA’s Terra satellite captured this false-color image on February 13, 2010. [But the image was released today, 6 days later.] Reaching a height of 4,835 meters (15,860 feet), Klyuchevskaya (also Kliuchevskoi) Volcano is both the tallest and most active volcano on Kamchatka. Dwarfed by its neighbor, Bezymianny reaches 2,882 meters (9,455 feet) above sea level. It released a smaller, thinner plume than Klyuchevskaya. NASA Earth Observatory image created by Jesse Allen. Caption by Michon Scott. Edited by FEWW. Click image to enlarge. 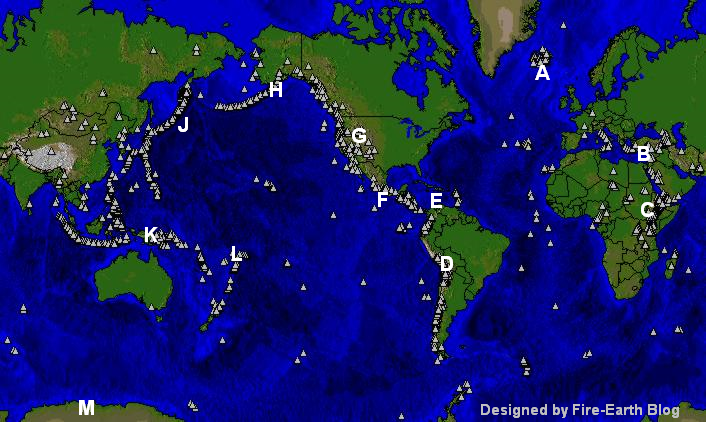 Kasatochi Volcano is one of many mostly submarine volcanoes whose summit emerges from the waters of the Bering Sea off the southwest coast of Alaska. After earthquakes and other seismic activities starting on or around August 7, Kasatochi began erupting large plumes of ash and gases. 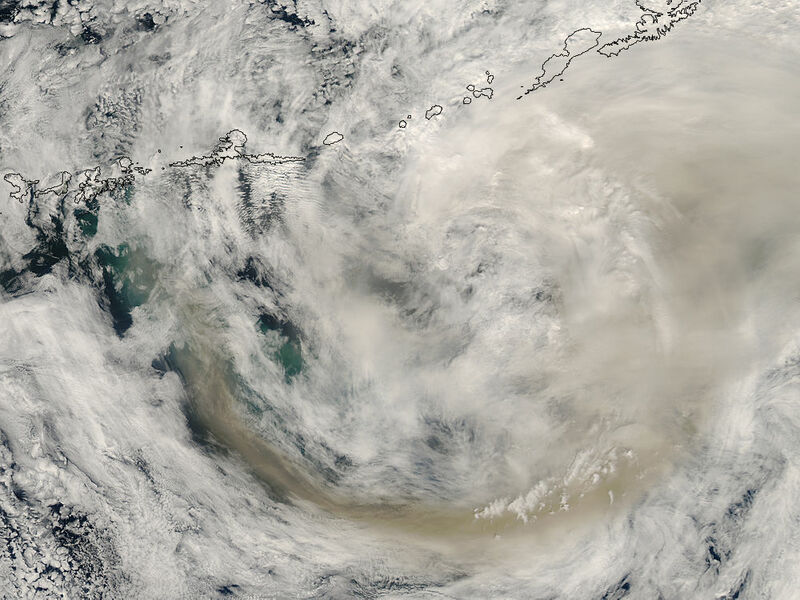 On August 8, 2008, skies were cloudy when the MODIS on NASA’s Terra satellite passed overhead and captured this natural-color image. 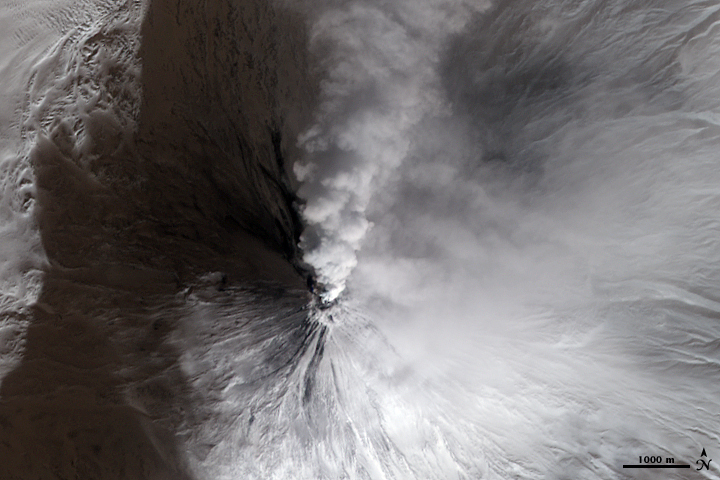 The bright clouds provided good contrast for the volcanic plume, which is dark brown.